More nursery inspiration today. I am loving the subtle yellow accents in these images that are styled by Susanna Vento. 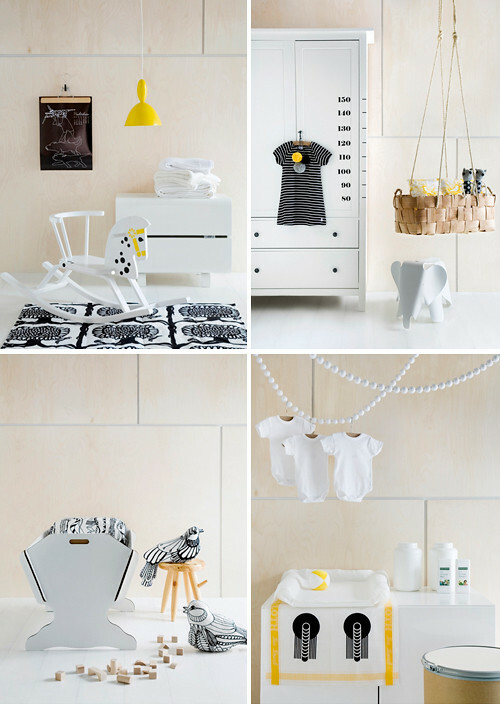 The beautiful Baltic Rocking Horse (top left image) is from Offi. This sturdy rocker has been in production for over 50 years and will never go out of style. The elephant in the top right picture is from Eames. The cardboard cradle (below left) is from Green Lullaby and it is available from Smallable. I know – where have I been? Sadly, I’ve only recently been following blogs, to look for ideas and inspiration for my own new home. The way rooms have been transformed is absolutely amazing, and it’s becoming more difficult for me to choose how to do a room because everything I see I am loving SO much! The thing I have been unable to find good ideas for are tween bedrooms. My daughter is nearly 12 anything to do with children’s rooms is either nurseries or the older teen. What about those “in-betweeners”. Anything out there for them? Amasing, where are the funny bed from?